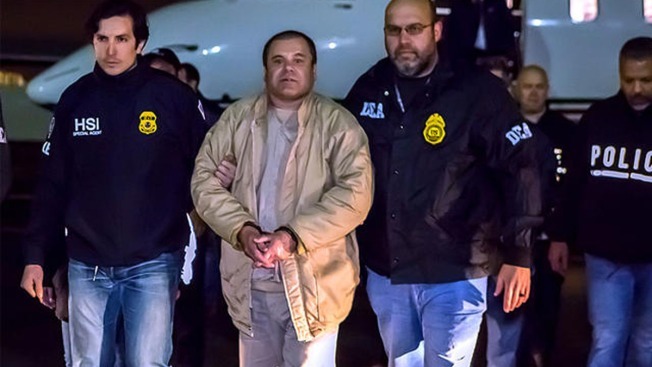 Notorious Mexican kingpin Joaquin "El Chapo" Guzman took a hands-on role in the grisly deaths of three kidnapped enemies of his drug cartel, including one who was buried alive, a witness testified Thursday at Guzman's U.S. trial. Isaias Valdez Rios told a New York jury that, while a member of the Sinaloa cartel security detail around 2006, he witnessed Guzman order his men to dig a grave before he shot a victim in a fit of rage. When the gunfire stopped, the wounded man "was still gasping for air," said Isaias Valdez Rios. "That's how we dropped in the hole and buried him." Jurors at a trial that began in mid-November had previously heard allegations that Guzman ordered assassinations to protect his cocaine-smuggling empire, a key element of a case the defense says is fabricated. But Valdez's chilling testimony offered the most detailed account to date of the cartel boss personally engaging in violence against those who crossed him. Valdez, 39, testified that he was a Mexican military veteran when he was recruited to join a team of gunmen protecting Guzman at one of his mountainside hideouts in Sinaloa. In a lighter moment, the cooperator described how a cheerful Guzman greeted him by saying, "Dude, how ya doin?" His tale grew much darker after a prosecutor asked him whether he'd seen Guzman harm anyone. He responded by spending the next few minutes talking about two separate executions in gory detail. The first involved the burial victim, who was a member of a rival cartel brought to Guzman's having already been bound, blindfolded and appeared half-dead having been burned with a household iron so severely that his T-shirt was stuck to his skin, Lopez said. Guzman interrogated him, left him to rot in a shed for a couple days and interrogated him again before ending his life. Another time, Guzman announced, "Guys, they are sending a gift," as a plane carrying two bound victims from another gang known as the Zetas landed on the compound air strip, Valdez said. Guzman told his men to take them to a secluded area to "start heating them up," meaning they should be beaten, he said. Guzman then took things into his own hands by asking someone to retrieve him a branch, he said. Asked by the prosecutor why a branch, the witness paused and responded, "Obviously, he didn't make that request to be affectionate towards them." Well into the night, Guzman tortured the victims by pummeling them to the point of leaving them with broken bones, he said. He then instructed his men to dig a hole and start a fire before ATVs were used to carry the battered men toward the flames, he said, adding the he saw fear etched in their faces. Guzman hurled profanities at one and then "boom, shot him in the head" with an assault weapon, the witness said. The second man met the same fate before both were dumped in the narco-funeral pyre that Guzman wanted fed with wood until daylight, he said. Guzman, he said told them, "I don't want any bones to remain."